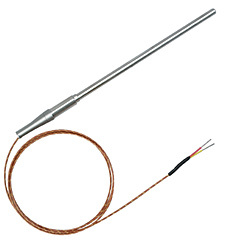 Matching Super OMEGACLAD™ XL mineral insulated thermocouple cable with our rugged transition joint probes and fibreglass insulated cable makes a combination that's hard to beat! Perfect for quick readings at higher temperatures or monitoring elevated temperatures for extended periods of time. Materials Sheath Dia. Upper Temp. Super OMEGACLAD™ XL probes (highlighted in yellow) are also available in N calibration; substitute NN for CA in Model Number.